Our volunteer trip initiators propose/offer a variety of MVP trips each year under the Common Adventure Model. 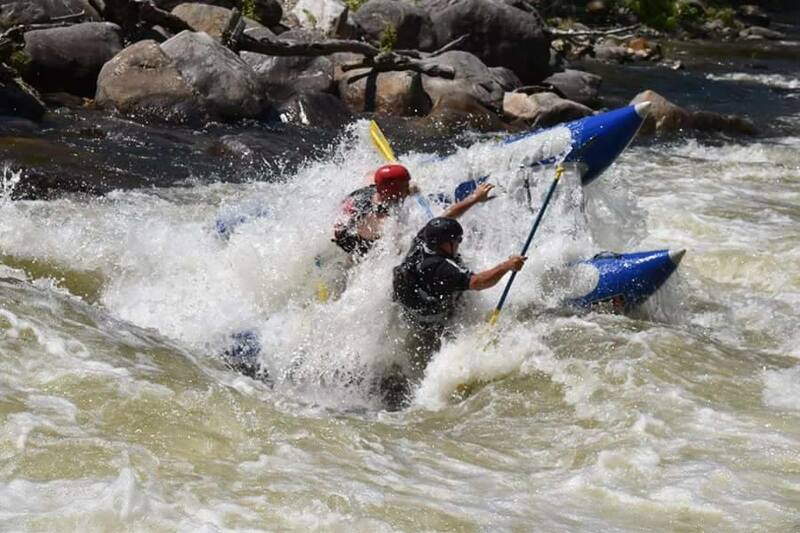 From Class 1 or class two “training” trips to class V outings and creek runs, to a multi-day camping excursion to Moose fest, Gauley or The Forks, we offer a wide range of trips for our club members. We are expanding to sea kayaking and lake/river touring trips for when the white water just isn’t flowing. Additionally, we provide a public forum to post drips or see who is interested in paddling on very short notice. On a Common Adventure trip, everyone is expected to share in the responsibilities of the trip. The trip initiator (the person who posted the trip) simply gets the ball rolling. The rest of the group is expected to help plan for the success of the trip, from the arrival at the put in until the trip has ended and everyone is safely on their way home. The success or failure of a common adventure trip rests not in the hands of the trip initiator, or MVP, but rather in the hands of everyone that participates in the trip. Common Adventure trip postings, in turn, provide a means of getting people together to participate in a paddling trip that might not have been possible if they had tried to do it alone. Any MVP member is welcome to initiate a Common Adventure trip on the MVP message board or web site MVPclub.org. These trips are available for all MVP members and friends who have sufficient experience required for the particular trip. The trip message board is also available to anyone wishing to post a more spontaneous trip. What are the key elements of a Common Adventure Trip. There are no guide fees. No group money goes to pay any one person among the group, nor does any money go to any outside individual or sponsoring institution or club. The cost of the trip is shared. Posting of Trip. The MVP member that develops a trip idea will post on the MVP message board. Trip Initiator. The person who posts the event is known in Common Adventure vernacular as the "trip initiator." He is not the trip leader. Since leadership on a Common Adventure is a fluid affair, involving participation from all members of the group, there is no such thing as a designated "trip leader." Sign-ups. Once the trip is posted, people who are interested in the trip should contact the trip initiator either by email or telephone so the initiator knows who to expect so they don‘t leave anyone behind at the put in. Trip initiator should post how best to contact him or her on the trip announcement. Beginning: The next step in the process is the pre-trip “meeting“. The pre-trip “meeting” is a key part of organizing a Common Adventure trip. Up to this point, the trip has been the trip initiator's idea. At the pre-trip “meeting“, it becomes a cooperative group project. This usually takes place over the telephone or email where the destination is determined and meeting times are established. Everyone who is interested lends input and all aspects of the trip should be discussed. Since the trip is now in the group's hands, decisions about the trip are made as a group. The group may decide to make some changes in the trip: where they go and what they plan to do. The “meeting” gives everyone a chance to find out exactly what the trip is all about. Some individuals may decide that after learning the details, the trip is not what they want to do and they can drop out. For those who decide to go on the trip, the “meeting” gives them a chance to be properly prepared and to learn what boat, equipment, etc. they need. Also, what skill level is expected for the trip. Trip Leadership. While on a Common Adventure trip, leadership is a fluid process. If someone knows the area, he assumes a leadership role, helping the group find their way. If there's an accident on the trip and someone has good first aid skills, they assume leadership. If a kayaker swims, another person may take over. Major decisions are made democratically as a group, with weight given to those with specialized knowledge. Often it is the trip initiator that guides the democratic process. In this process, everyone is able to express their opinions and shed light on the decision. By involving everyone, the group is able to tap all of its resources, making it far stronger than if one person tries to make all of the decisions. Trip Safety. Because everyone's opinion is important and because everyone is working for the common good of the group, trips are safer. Among their responsibilities, members of Common Adventure groups keep an eye out for one another. Because of the open, democratic environment, they are less apt to hold back when they see potential problems. This participatory form of safety is highly effective, certainly more effective than if only person is in charge of keeping track of the group. Personal Responsibility. It is the responsibility of those intending to participate in a Common Adventure Trip to be honest with themselves and other trip participants regarding their skill level and experience. Other trip members have the responsibility to lend guidance regarding what skill level is required for a particular trip however that should be tempered with the idea that many trips may be good experience for those trying to expand their skill set and experience level. Since a Common Adventure tip is a democratic endeavor if the majority of the group has reservations about the ability of a particular participant the group should reach a consensus about how and if the particular individual should participate. It is the responsibility of the trip participants to honestly evaluate their level of skill and not potentially endanger each other by consistently grossly exceeding their skill level. If they choose to do so, the results are ultimately the sole responsibility of that participant. Any questions or concerns should be directed to the MVP Board of Directors. There is frequently a Post Paddle Pig-Out after trips, so save some time and bring money and a change of clothes to enjoy a good time at a local restaurant with your paddling pals!